In a corner of Maria Hernandez Park, a toddler teetered over to the new, gray thing lying on a patch of grass. With his tiny sneakers, he hopped on top — it didn’t move. With his little hands he reached for a cup — it didn’t move either. He stomped around and tried, unsuccessfully, to pick up a stack of plates. He giggled and waved over his mom, who indulged him for a minute or so before leading him back to the group. 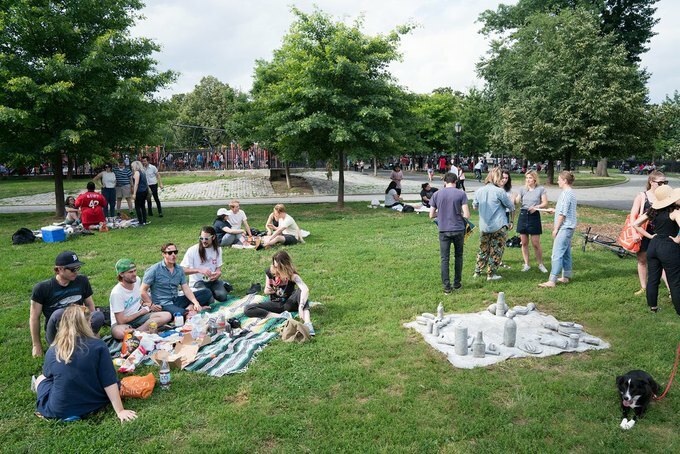 For the rest of that bright, boiling July afternoon, children and adults alike ambled over to the concrete picnic glued to the earth. They examined and nudged and smiled at the new addition to the park. It was exactly what the artist envisioned. 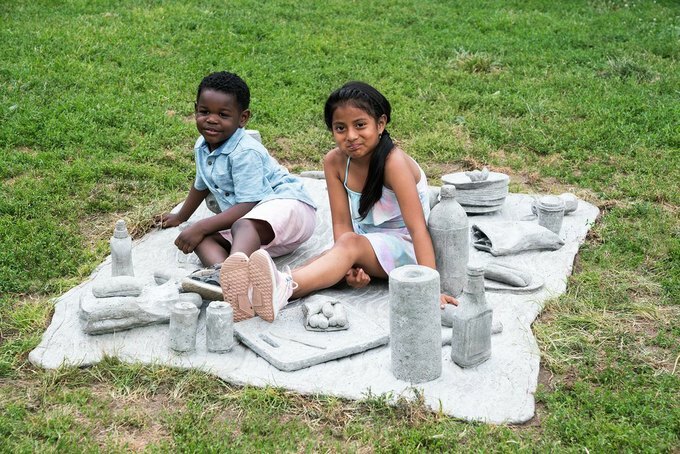 Tamara Johnson created “Picnic” specifically for Maria Hernandez, which until now has never had a public art sculpture. 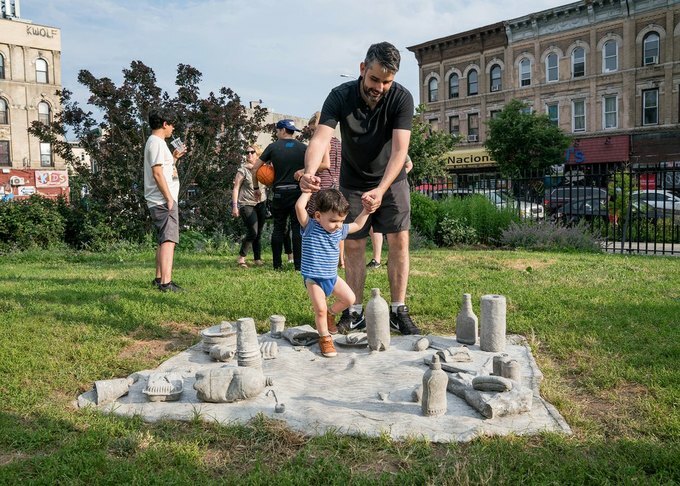 She installed it at the end of June, after five months of work and years of brainstorming, near the park entrance at Knickerbocker Avenue and Suydam Street. Creating art for Maria Hernandez presented a groundbreaking new opportunity, but also a set of challenges. The park is the nucleus of a lively, largely Latinx neighborhood, where families have lived for generations. Johnson saw it as a neighbor, but even more closely at the Bushwick community board meeting, where she presented her project. She had to do some convincing. Johnson, 33, has lived in Bushwick for six years, since graduating in sculpture from the Rhode Island School of Design. 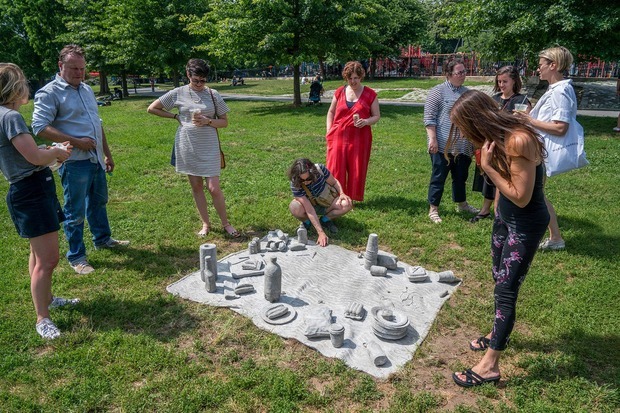 Until about two weeks ago, she lived three blocks away from Maria Hernandez — she FaceTimed from Dallas, where she recently accepted a two-year contract at Southern Methodist University teaching sculpture — so it felt most natural that, when given her choice of park by the New York City Department of Parks & Recreation to create a piece for, it would be this one. 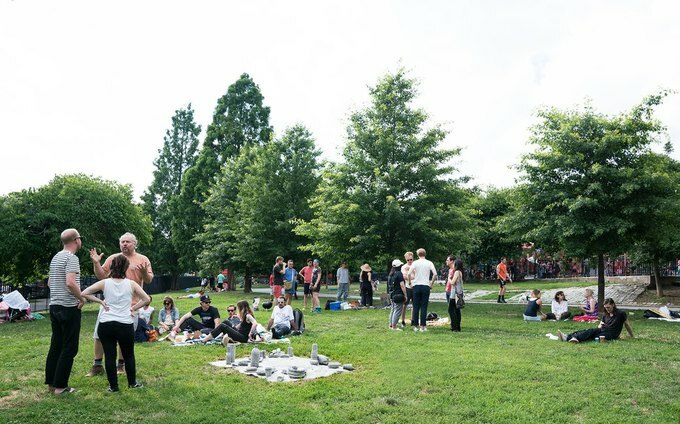 While art in parks like Madison Square and Central is beautiful and essential, it’s expected. Parks like Maria Hernandez, which hold such cultural significance, can only benefit from having public art, Johnson explained. There should be something different and unique for everyone. She started playing with the idea of public space in New York, which is often a sidewalk or park, a cemetery or a plaza, and how people relate to it. 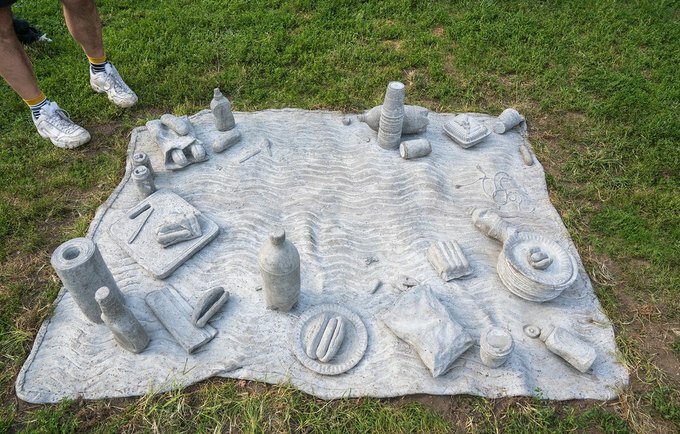 To represent that, most of the material is concrete. A picnic to her is the universal symbol of a park, not a playground or basketball hoops or benches. It comes and goes. People gather and relax and bring food that speaks to their culture. Johnson wanted to shoot for a summer installation. For five months, she worked in her studio in the Navy Yard, making the blanket in two parts and molding the objects separately. She embedded mesh and rebar that made it heavy — a whopping 1,000 pounds — but secure. It was meant to be interactive intellectually and physically; she knew it would be stood on and touched and probably kicked. It was a lot of on-site finishing and detail work, she said. The children around weren’t shy, she said, coming up wide-eyed, asking what was happening and if they could help. Local adults approached her, too, wondering what she was doing. Many opened up about how many years they’ve lived down the street, their history, their relationship to art. They shared whether they thought the piece was a good idea, or a bad one. She used to walk by it everyday, checking on it, sweeping off the grass. She’ll be back and forth with her fiance, but she said she knew going in she couldn’t control what happened to it. “Picnic” will remain in Maria Hernandez until March 2019. Johnson said she hopes it’s carved out a space for future projects. 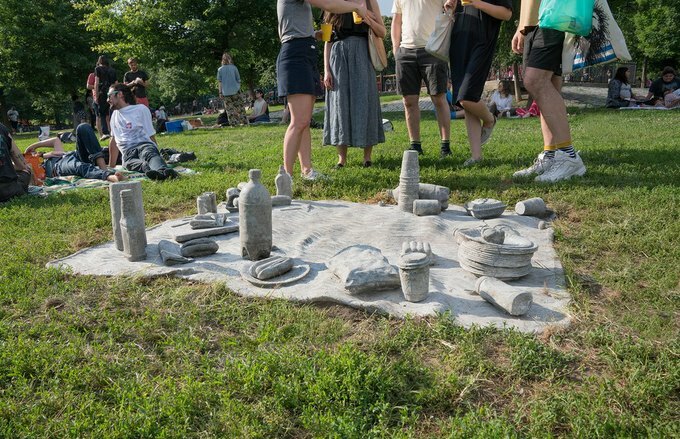 "Picnic" is sponsored, in part, by the Greater New York Arts Development Fund of the New York City Department of Cultural Affairs, administered by Brooklyn Arts Council (BAC). Many thanks to Elizabeth Masella and Jennifer Lantzas at NYC Parks and Recreation Department.